Nice mini history of Orinthia’s life. Thank you for finding out about Orinthia’s later life. I have occasionally wondered if she knew Susan Clapp, who was a school teacher in N. Bridgewater and Stoughton, later teaching freed slaves in North Carolina for a year after the war and moving on to another mission on Martha’s Vineyard, teaching the Portuguese, blacks, and some Native-Americans. She confers with Oakes for his advice about starting a school of her own, several years after the time of Evelina’s diary. We have several years worth of her diary, which has been transcribed, but not yet published or posted on our website. When I look at the chronology, it is unlikely that she and Orinthia crossed paths, but since she was living just a few miles away on Bay Road, it is possible. The diary of Susan Clapp sounds wonderful – perhaps she and Evelina at least knew of each other. It was a small world back then. Susan records much more in each entry than Evelina does, more than half of it heavily-religiously-oriented, for better or for worse. Clearly her religious beliefs are at the core of her life and she does not have a husband, children, or household to work for. It is interesting that her strong beliefs in serving the Lord apparently gave her a way of avoiding the traditional role for women. She mentions at least one guy, who had proposed to her and gotten rejected, supposedly because she did not deem him a true believer. Ironically, she meets him later with the woman he has married and he has become much more of a believer, causing a few vaguely worded possible second thoughts on her part. It’s too bad that she was not an Ames, or we might lure you into continuing your blog with/on her journal. One thing that has long interested me about Evelina is her reticence about religion. She goes to church regularly, we know that, and she clearly has great respect for the local clergy. Family lore has it that somewhere there is a Bible that she inscribed to her son Frank. But over the course of her diary, she never mentions reading the Bible, or refers to God. Not once. Why? Was this an instance of her general lack of introspection? Was she simply focused on the prosaic? Was this a Unitarian-minded lack of display? It’s so interesting to me that in the middle of the 19th century, when religious fervor had produced a great splintering among Protestants into dogma-specific sects, when Boston itself had been the birthing room for Unitarianism and Transcendentalism, when piety informed most popular novels – Uncle Tom’s Cabin comes to mind – that Evelina herself made no reference to worshipping or serving the Lord. Your Susan Clapp felt differently, evidently, and I hope someone decides to research her. But it won’t be me. I’m hanging up my blog after December – at least temporarily. 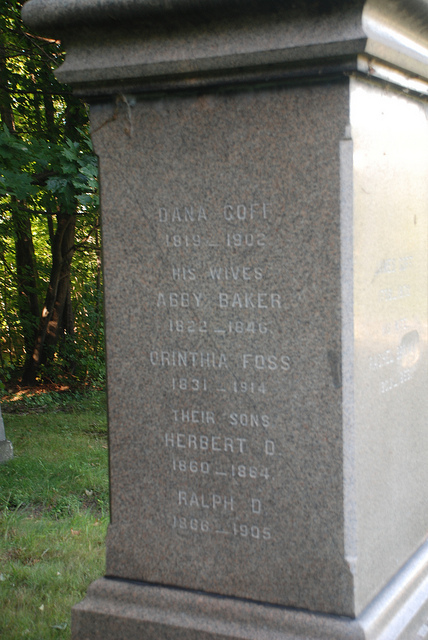 I have it in mind to look into the lives of two Ames women of a different decade: Blanche Ames Ames and Minnie Ames Frothingham, two fierce, smart women who happened to be on opposite sides of the suffrage question. What shape the research will take, I don’t yet know. But I think the narrative will be fascinating.